Google Now is the intelligent, voice-controlled digital assistant baked into Android and various other parts of the Google ecosystem. If you need to get a lot of information from Google Now in a short space of time, here’s a trick you might not yet be aware of. 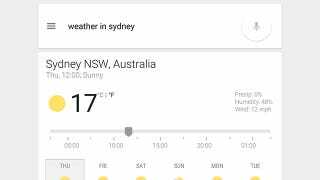 Whenever you ask Google Now anything—whether it’s “how long will it take to drive to London?” or “what’s the weather in Houston?”—you can then say a follow-up query, such as “what about Sydney?” Google Now notes the conversation you’re already having and shows the same results for the new place, whether it’s a weather forecast, driving route, or whatever else. In fact, you only need to speak out the new place name for Google Now to get the message. It works with questions about people, movies, and various other answers too—just say the new variable with the existing Google Now result on screen, and you’ll get your answer back based on the original query.